When I was growing up I never heard anything about famous women artists, and very few examples of famous women in other fields of endeavor. My mother was a painter and a fashion illustrator and she took me to art museums to see masterpieces that had been created throughout history. Where were paintings by women? I remember a little boy telling me that girls had never done anything in the way of inventions, great art or science. Erroneous of course, but a common belief -- there was very little about women in our textbooks. It was many years later that I saw a groundbreaking museum exhibition in Los Angeles exclusively made up of women artists, from medieval to modern times. I was astonished. Why were these painting – these women’s names – not widely known? The accompanying catalog of the exhibit was a thick book of wonderful paintings by women artists who, in spite of historical and societal difficulties throughout history, had persevered to create paintings as exceptional as the works of male artists. Around the time of the museum exhibition I saw a PBS documentary titled Anonymous was a Woman, by film-maker Mirra Bank. The film expressed the belief of art historians that many unsigned 18th and 19th century American folk paintings were created by women. The memory of that film stayed with me, and I wanted to honor those women folk artists – there are very few who signed their names, and little is known about them. I chose to write a fictional story which would represent issues that might have made it difficult for a young girl in 1830s America to be a professional painter. My book, Signed, Abiah Rose was released in June. It is about a young folk painter who is determined to succeed in her chosen profession and to sign her name to her paintings. Unlike when I was growing up, there are now many enlightening biographies and fiction books relating to women’s talent and contributions to the world. There are books that encourage girls to pursue their dreams, showing girls are capable of the same achievements as their male counterparts. I believe there is always a need for books to encourage self-esteem in children -- books about dreams and success, and about girls who succeeded despite being told “no” too many times concerning their education, their careers, their very lives. Below are some of my favorite picture books about women artists. The artists and the paintings they created were very different from one another. What did they have in common? They all lived to paint and they wouldn’t have taken “no” for an answer. 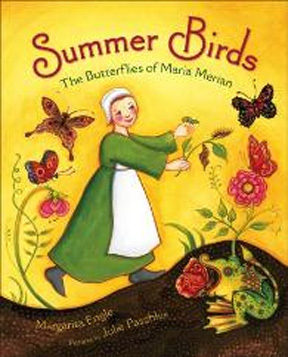 I was happy to discover Summer Birds by Margarita Engle in my local bookstore. (Our books had been reviewed together by a North Carolina newspaper – favorably! – as new books about girl artists.) Maria Sibylla Merian was a 13 year old German girl, who had shown artistic talent from an early age. It was the mid-17th century and Maria loved to study butterflies and other insects – in secret to avoid being accused of witchcraft! From her observations she would be able to prove that butterflies did not spring from mud as “beasts of the devil” which was the common belief at the time. When she was older, continuing her studies of insects, plants and natural phenomena, she would travel across the world making her beautiful meticulous paintings of plants and of insect life cycles. Today her work can be found in the collections of art museums around the world. I was fortunate to see a large exhibit of her amazing work at the Getty museum last year. Julie Paschkis’ bright and joyful illustrations beautifully express Maria’s excitement in her world of discovery. The book’s title is taken from an expression referring to butterflies and moths which appear in the summer. I love folk art. 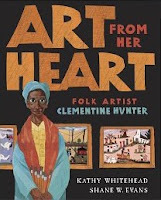 While I was researching for my book I came across Art from Her Heart (by Kathy Whitehead, illustrated by Shane W. Evans) about folk artist Clementine Hunter. Without training and after a life dealing with prejudice and poverty, Clementine Hunter first began to paint in 1938, at age 50. She painted on whatever surface she could find—boards, bottles, window shades. She painted her memories of a long life working as a manual laborer on a Louisiana plantation. She would go on to sell her paintings and eventually this descendant of slaves would see her work exhibited in the New Orleans Museum of Art (although because of segregation she herself would not be able to enter the museum during business hours). She would paint for almost 40 years, and was an example of how “art can keep the spirit alive.” She was a remarkable woman whose work is appreciated to this day. Shane W. Evans’ colorful illustrations, paired with Clementine’s delightful folk paintings, work well to tell Clementine’s inspiring story. 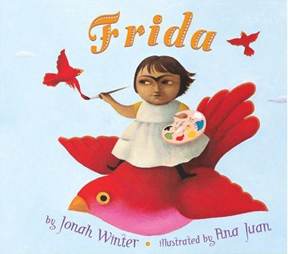 Jonah Winter’s book, Frida, is simply told, poetic and inspiring, with beautiful and whimsical illustrations by the very talented Ana Juan. The colorful, magical, folk-art-influenced paintings of Frida Kahlo have long been favorites of mine. Her art was like no one else’s, and it was strongly influenced by the difficulties in her life (encompassing the first 50 years of the 20th century). An early bout with polio and a terrible bus accident resulted in a life of pain. But nothing could keep her from painting. She channeled her pain into her work. She painted fantastical dreamlike paintings, imaginary friends and many surreal self-portraits. She was bold, brave, fierce and irreverent and was loved and known all over the world. This book is a wonderful tribute to her. 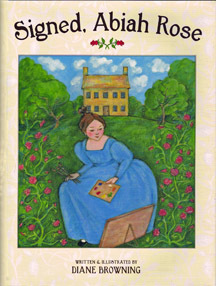 Diane Browning is the author/illustrator of Signed, Abiah Rose (Tricycle/Random House 2010). Her first picture book, it received a starred review from Booklist and was named to their Top 10 Historical Titles for Youth and Top 10 Art Titles for Youth - 2010. It was also chosen for the ALA Amelia Bloomer Recommended Titles List – 2011. Visit her blog at http://www.dianebrowningillustrations.com/. I love your book and enjoyed learning what inspired you to write it. It's a perfect book for girls who dream of becoming artists. Thanks for your wonderful post. I was an art history major way back when and the only woman artist I remember learning about was Elizabeth Vigee LeBrun, who was court painter to Marie Antoinette. 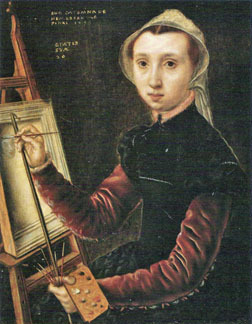 Maybe someone will do a YA novel on her--apparently she started painting professionally at a very early age (not surprisingly her father was an artist too). Thank you for a great post, Diane. I so enjoyed your lovely book, and you've now inspired me to read the other books on your list. SIGNED, ABIAH ROSE sounds perfect for this month & I look forward to enjoying it in person Diane Browning, who I don't know but hope to meet some time. Women artists in my school days were inscrutable - you knew they were there, but we didn't hear about them. I appreciated the Clementine Hunter book but haven't seen the others, so this post is connecting me to great titles I haven't yet met. Our daughter is an art history major so today's post url is going to be on her Spring Break pile of info when she get home next wk. Feminist Art Project Rutgers U. Also, this post is brining up all sots of connections - thank you again. Thanks to all of you for your lovely comments on my post(and about my book)! And thanks, Jan for the book suggestions and for the Rutgers Project link. Are women artists still mostly unknown? I have heard about a recent on-the-street question and answer session outside an art museum which suggests that might be true...none of those questioned could name a woman artist. But that's why sites like this and all the children's books being written to celebrate women's accomplishments are are such a good idea! Intriguing and inspiring post, Diane. What will be interesting is if children today see any change in this perception of women artists. Or will they only be able to name just a few when they become adults? Wonderful post about a vitally important topic. I love the picture books, Frida, and of course, Signed, Abiah Rose -- now I must look for Art from the Heart and Summerbirds! Nice post. I had fun reading it. Learned something new too.